Kody was a 10 week old puppy when Erin Grey purchased him from me. Erin trains wild horses, shows horses and had owned a rescued Mastiff. She wanted to learn about and begin showing dogs. I thought she would be a good match for mastiff ownership and agreed to sell her a puppy and assist in her show training. As best friends Erin and Kody worked together on her ranch side by side. The winter of 2003 brought a very severe ice storm to Portland, Oregon. Erin’s neighbors wouldn’t be able to get home until late in the afternoon and she went to their house to check that their horses were okay. As Erin and Kody were standing at their gate, trying to open it, Kody suddenly grabbed Erin's arm and pulled her away from the gate. A tree limb fell just where she had been standing. You see, Erin is deaf! Kody had heard the cracking of the limb that Erin was unable to hear. Although only 1 year old at the time, and without formal training, he responded to the falling limb instinctively. They are both in tune to each other’s movements and needs. Erin went on to become a competent show person, and with some assistance from me, took Kody to his Championship. Erin and Kody are best friends and soul mates for life. Thank you for this story. It inspired me. 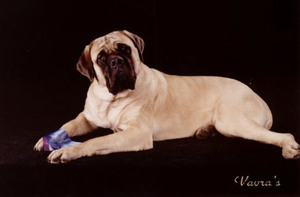 I know one day I will have my own english mastiff.